After the rather successful last Don't Make Plans For Saturday (ending in a rioutous double whammy of Hot Chips Ready Fot The Floor and Richie Havens Going Back To My Roots) the night returns next Friday March 7th. 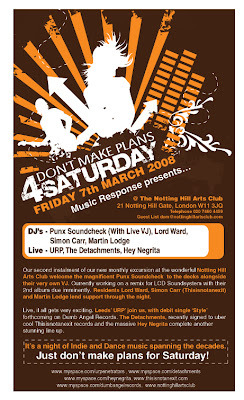 A similarly exciting line up - with most interest being in myself (Simon A. Carr) DJing and Thisisnotanexit signings Detachments entering the live fray. Exciting stuff. Free before 8pm so you can't complain really. In other news at Thisisnotanexit towers we are heading into a rather busy period. After that we have the new single from They Came From The Stars I Saw Them entitled The HOT Inc. - a call to arms against the celebrity obsession that rules our land. Its going to be across both a 7" and a 12" and will feature new track The New Wave Of The New Brilliant alongside remixes from Geek Chic Soundsystem, Eugene Machine and a man we can't reveal the true name of but is known only as MoscoW. MoscoW is currently working on remixes for Lesser Panda and The Foals so he's one to watch. Deep tripped out smacked out disco f8ckedness. And then we have the new album from They Came From The Stars I Saw Them - their finest most pop most hook laden work to date. Already gaining fans across the music press this could be an outside bet for the Mercury nominations this year. YES! THAT GOOD! The second single MOON SONG could be the tune of the summer! In other news there has been some great music emerging recently - Midnight Steppers on Dissident, the latest Pepe Braddock, Truffle Clubs 'Gone Blue' finally coming out on vinyl, the latest Toby Tobias on Rekids is ace (and watch out for the Kathy Diamond collaboration called The Feeling out in May - killer! ), Hercules & Love Affair are more hyped than a very hyped thing and justifiably so as the album is ACE, they've also turned in glorious remixes of Goldfrapp and Aeroplance recently too, the Glass Candy Remix of Ssion is nice (pic disc too! ), Richard Gateuax DUNE is worth a look, Juan Macleans Happy House is absolutely MASSIVE, Villalobos DJ tool Enfants is suitably insane but is a genius tool for layering into your sets, The Lovefingers Blackdisco 12 is aceness (head for the B2 track 1984 - seriously smoking), the new Omar S one sider is deep beautiful house, and the Compost 12 featuring Jamie Llloyd is simply stunning. On a retro tip my secret weapon recently has been Mory Kantes Yeke Yeke Hardfloor Remix which slayed Nottingham the other week. Tip to DJ McFarda for reminding me of its quality. That'll keep you busy pop pickers. Oh and put Saturday 15th March in your diary - THISISNOTANEXIT VS. ALLEZ ALLEZ at The Amersham Arms and a stunning line up: Trevor Jackson, Detachments (LIVE), Allez Allez DJs and Simon A. Carr on the decks and laptop. Top top top night. I've been booked to play at Nottinghams Stealth club on Saturday night as part of the Stealth vs. Rescued night. I'll be playing with Jonnie Wilkes (aka Naum Gabo) (Optimo) as well so should be a great night - Simon A. Carr and Jonnie on from 11pm - 5am - a recipe for a good time! If you like the man that is Hatchbacks music he's also done a really nice interview and mix for the Cosmic Disco site. Go check it out. We'll have his next single JETLAG featuring a TASTY Faze Action remix out real soon on the label. Finally thanks to everyone who downloaded and enjoyed Thisisnotanexit Volume 9. Somehow its had over 17,000 downloads. All I can say is WOW. I've got a weekend off in a couple of weeks so will spend a Sunday morning cellotaping a new mix together then. I have loads of new stuff lined up for the label thats hugely exciting which should get a preview - The Dark Esquire and Club Silencio. Watch out people Thisisnotanexit is just gonna get better and better this year. 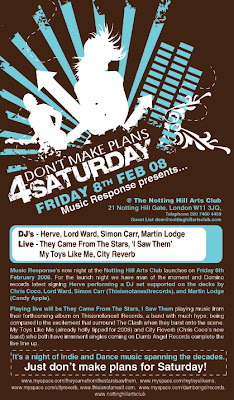 Flyer for the party this Friday - Simon A. Carr DJ set and They Came From The Stars I Saw Them LIVE! Plus loads of other stuff. Come get drunk and dance with us.